Several years ago, I heard my first raves of Divvies chocolate (though they certainly wouldn’t be the last!) from food allergy mom Barb Nicoletti. Barb buys their solid chocolate Easter bunny and jelly beans every year for her two allergic little ones. Though the bunnies are only seasonally available, Divvies chocolate is produced year round in other fun shapes, chips, and bars. 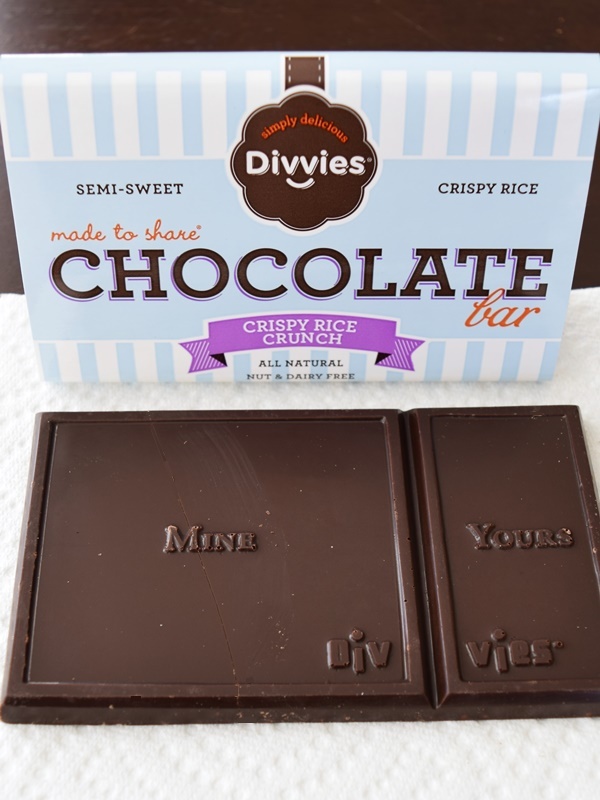 I finally had the chance to enjoy Divvies chocolate myself, when founder Lori Sandler appeared at the Food Allergy Blogger Conference. 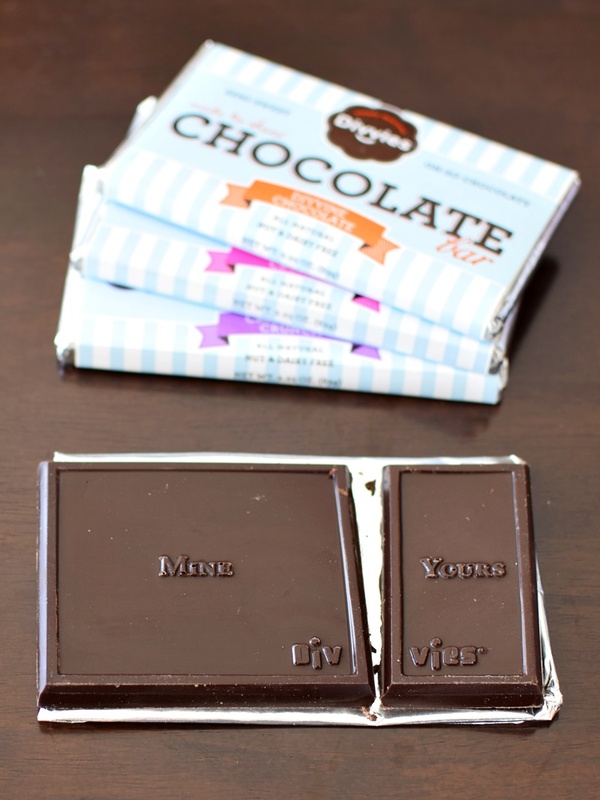 Divvies chocolate is made in their dairy-, egg-, and nut-free facility. The allergy-friendly nature is what spawned their sweet slogan, “made to share”. I learned from their delicious chocolate bars, sharing doesn’t have to mean a 50/50 split. Quite possibly the closest thing I have ever tasted to a dairy-free Nestle Crunch bar! These adorable but rather large semi-sweet bars are the perfect combination of indulgent sweet and cocoa richness. Perfect for those who are missing that classic candy bar vibe. The pure brown rice crisps had just the right amount of prevalence and crunch. This minty flavor was equally delicious to the last. 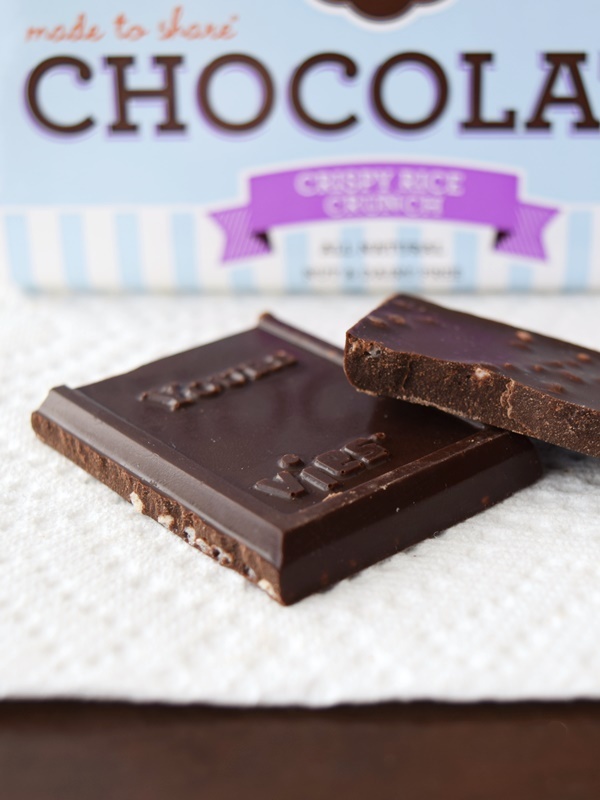 It’s a semi-sweet chocolate, just like the Crunch Bar, but instead of crispies, it’s infused with sweet, potent, crunchy bits of peppermint candy. 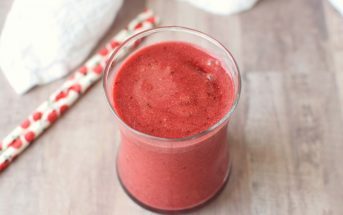 The flecks of peppermint candy gave it just enough mint flavor without overpowering. It had a nice refreshing bite to it. Oddly enough, the classic, no frills variety, is the last one that I sampled. It’s a good, solid semi-sweet dark chocolate that is both adult and child chocoholic-friendly. We found it perfectly noshable (almost too much so!) and I still giggle every time I see that “Mine” and “Yours” lopsided division. It’s good to know that even though Divvies has a “made to share” motto, they’ve still got their priorities straight – after all, it is chocolate! Certifications: We didn’t note any certifications on Divvies Chocolate. 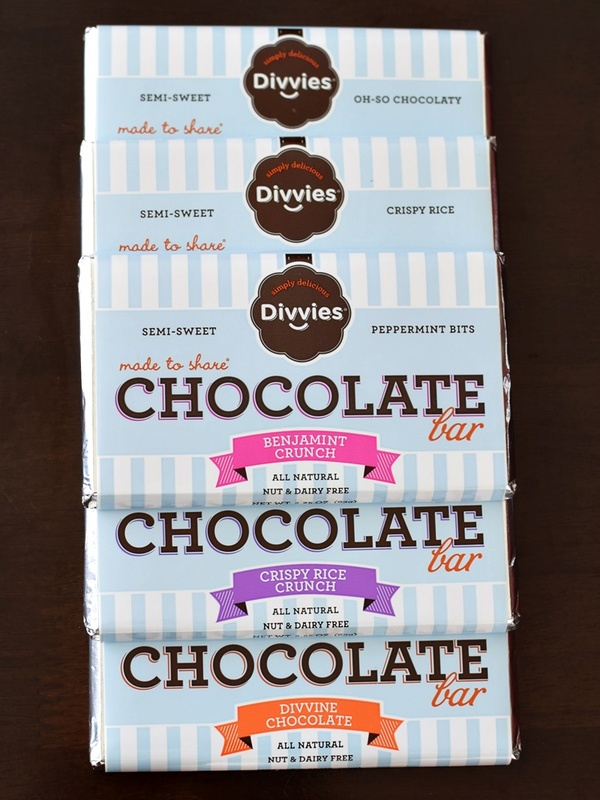 Dietary Notes: By ingredients, Divvies chocolate is dairy-free / non-dairy, egg-free, gluten-free, nut-free, peanut-free, vegan / plant-based, and vegetarian. Nonetheless, always read the ingredient statement and check with the company on their manufacturing processes for all varieties if potential allergen cross-contamination is an issue for you. Processes and labeling are subject to change at any time for any company / product. For More Product Information: Visit the Divvies website at www.divvies.com. A classic-tasting semi-sweet dark chocolate is the Divvies’ base, and it really is “made to share”. We found the depth and sweetness satisfied adult chocoholics, but was light enough for little taste buds. The Rice Crunch bar was very comparable to a Nestle Crunch (and my personal favorite), but without worry of dairy or nuts. The Benjamin Crunch adds a crunchy peppermint candy twist that we all enjoyed. In fact, these generously-sized and perfectly-portioned bars (we thought the “Mine” side was just right) are almost too easy to eat! I’ve ordered Divvies products for my milk/egg allergic son. Great taste and wonderful knowing he doesn’t have to worry about a reaction. My only disappointment with Divvies (as with all allergen free companies) is the cost. I remember reading a study about how much more expensive it is to raise a child with food allergies or other related issues. 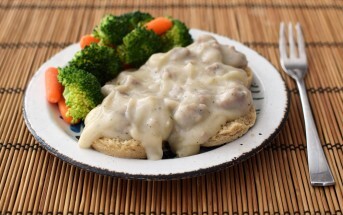 Besides spending money on expensive meds, we are also paying double for all the allergen free foods and drinks. I’m sure it costs these companies more to keep a safe mfg. facility and as happy as it makes me to able to give my child “real” chocolate bunnies and treats I have to shake my head after placing an order (with shipping charges) and think… I’m paying this much for these few chocolate bars (or chocolate chips)? But I am grateful that these items are available to us. My son is now 18 and did not have these treats available to him when he was younger. Just wish allergy families could get a little break on how much we spend on treats. Hi Peggy, I hear your pain, but indeed, since they do not have mass-market demand, it can be very hard for smaller companies to compete with, say, Hershey’s. Not to mention, the quality with brands like Divvies is SO much higher. Not only do they appreciate your support, but those of us in the free-from world appreciate you. The more of us that help to support these small businesses, the more options we will continue to have. And, if we spread the word (to schools and other places where allergy-friendly treats should be shared with all!) then prices may level out a little. That said, a lot of it is straight up inflation and the increasing prices of real food commodities. I think everyone is hoping that commodity prices go down a bit! are your chocolate bunnies gluten free. Yes, all Divvies nut & dairy free chocolate is handpoured in a dedicated nut, egg, dairy & gluten-free facility where only our chocolate production takes place. Thank you for asking!